Take your vehicle transformation to the next level with perforated window film custom crafted by Genesis Graphics & Signs, Inc.! Perforated window film is a fantastic way to take a full or partial vehicle wrap to the next level. Your vinyl window film can be printed with your logo, business information, or any graphic you desire, allowing you to personalize your vehicle any way you wish. Perforated window film allows you to provide privacy for your vehicle patrons, who still benefit from full visibility. 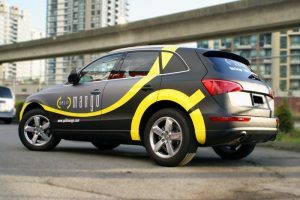 While outsiders can only see your marketing messaging adorning your windows, your vehicle occupants are able to clearly see their surroundings unimpaired. This is a great way to add a high-impact finish to your commercial vehicles. Call Genesis Graphics & Signs, Inc. today at (832) 293-4899 for your Free Consultation! When it comes to taking your brand on the road, vehicle wraps are the way to go. But nothing complements your wraps quite like vehicle window film. 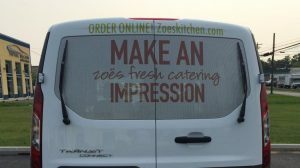 Your vehicle wraps often include your logo, graphics that complement your business, and sometimes your contact information. By utilizing your windows, you can take your graphic design to the next level. 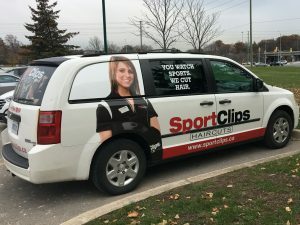 Instead of mushing your logo, graphics, and business information on your vehicle, you can put your branding information on your windows, increase your logo size, or make it even more dynamic! In addition to taking your vehicle transformation further, vehicle window film is entirely legal, provides some privacy to the inside of your vehicle, and allows your vehicle inhabitants to see perfectly! Many businesses utilize their windows to add their companies catchphrase, essentially helping to cement their brand into the minds of any who see their vehicle. As a full-service, local signage shop, Genesis Graphics & Signs, Inc. not offers complete fabrication services, but also professional design and installation services. This means that we handle every aspect of your signage project. We begin with a free consultation where our experienced signage consultants work with you to understand your business visibility goals, ideas, and needs. By working with you, we can ensure that you get the right type of product to fit your budget, brand, and business, rather than a costly product that does little or nothing to help you reach your marketing goals. Once we have an approved project, our experienced fabrication team will work quickly and efficiently to create your vinyl project. By using state-of-the-art equipment and high-quality, sustainable materials and business practices, we deliver the solutions you need in the timeframe you need it and within your budget. After your project is complete, our installation team will carefully install your window film, ensuring your vehicle film is free of bubbles, warps, ripples, and is aligned perfectly and looks fantastic on your vehicle! At Genesis Graphics & Signs, Inc., our mission is to provide you with attractive, eye-catching solutions and excellent customer support. Our team is eager to discuss your business and brand needs, and provide the solutions your business needs. So when you’re looking for a reliable signage partner who will be there for you on both jobs big and small, look no further than Genesis Graphics & Signs, Inc.! Call Genesis Graphics & Signs, Inc. today at (832) 293-4899 for your Free Consultation with a Vehicle Window Film Expert! Great people, great service, great results.